If you have several logs to split, they have met their match. 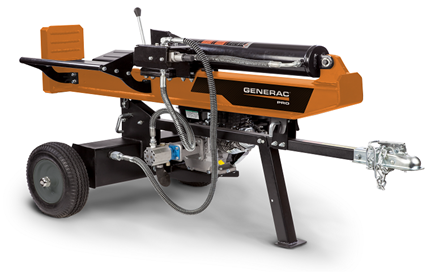 The Generac PRO Horizontal-Vertical Log Splitter easily adapts to cut in any direction. Simplistic operation and a 16-second cycle time make using the unit stress-free. This splitter goes to work by applying 34 tons of force. The power is enough to split even the biggest logs. This log splitter is equipped with a ball hitch, so you can tow it with a lawn tractor, ATV, or UTV. Bring it to multiple locations easily. This unit is road ready up to 45mph with DOT approved tires. While some log splitters only split horizontally or vertically, this unit does both. No need to lift heavy logs onto a table—save your energy for more enjoyable tasks! You’ll spend less time reading instructions so you have more time to get the job done. The Generac PRO log splitter is simplistic in operation, great for periodic use. 15.0 ft-lbs Generac G-Force Engine- Durable and powerful. Rugged Hydraulics- The pump is designed with hydraulics that exert 3500 PSI in the cylinder. Splits Longer Logs Than Most- The PRO log splitter can split logs up to 30 in. in diameter and 25 in. in length. Short Cycle Time- 16 seconds to be exact.